More than 111 limbs have been amputated due to injuries sustained during Gaza’s Great March of Return. Twenty-eight members of armed groups were among the fatalities, as were 15 perpetrators or alleged perpetrators of attacks against Israelis in the West Bank, according to OCHA. More than 60 percent of the fatalities and nearly 80 percent of the injuries took place in the context of the Great March of Return – mass protests held regularly along Gaza’s eastern and northern perimeter since 30 March. According to Gaza’s health ministry, some 14,000 people were hospitalized for injuries sustained during the protests, while more than 12,000 were treated at field clinics. More than 6,000 Palestinians were injured by live ammunition during the Great March of Return. The demonstrations call for an end to Israel’s blockade on the territory, now in its 11th year, and demand Palestinian refugees’ right to return to the lands from which their families were expelled during, before and after Israel’s founding in 1948. Israel has used deadly force against unarmed protesters during those demonstrations, provoking the condemnation of UN human rights officials and an unprecedented warning from the chief prosecutor of the International Criminal Court. But in the absence of meaningful accountability, and with the blessing of its highest court, Israel continues to threaten Palestinians with violence if they approach the fence along Gaza’s eastern boundary. On Thursday 12/26, COGAT, the bureaucratic arm of Israel’s military occupation, pulled back its curtain of humanitarian propaganda to reveal its true face of oppression. COGAT published a video on Twitter in which an Israeli colonel warns Palestinians in Gaza not to approach or damage the boundary fence, harm Israeli soldiers or “violate Israel’s sovereignty.” Otherwise, Palestinians “will be answered with a determined response” by Israeli occupation forces. That “determined response” will likely mean lost lives and badly damaged bodies, judging by Israel’s past behavior. 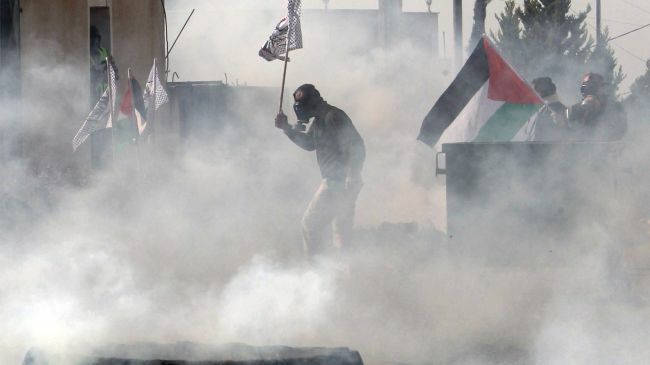 “Israel’s shocking – and often lethal – use of force against protesters has resulted in the deaths of scores of Palestinians, and thousands have been injured by live ammunition, rubber bullets and tear gas,” Medical Aid for Palestinians stated earlier this month. According to the World Health Organization, 111 amputations – 20 involving children – have taken place resulting from injuries sustained during the demonstrations. Nineteen people have been paralyzed due to spinal cord injuries, and six people have permanent vision loss. Three health workers were killed by Israeli forces and another 546 injured. More than 80 ambulances have been damaged, in addition to other losses. Gaza’s overburdened healthcare system, in addition to coping with the staggering number of protest casualties, has meanwhile had to contend with zero stocks of essential drugs and supplies resulting from Israel’s siege. During the year hospitals reduced operations as as they ran out of fuel to run emergency generators during electricity-starved Gaza’s frequent blackouts. Four Palestinians, including a 16-year-old child and a disabled man, were fatally injured during Friday 12/21 Great March of Return protests. Palestinian factions in Gaza said that Israel “crossed red lines” by killing people who were standing 300 to 600 meters from the boundary that day. Rights groups told the UN Human Rights Council in September that there was no evidence that any protester killed by Israel was armed. Amnesty International has condemned Israel’s “apparently deliberate attempts to kill and maim” Gaza protesters.